a. -- Jol-lée (-----); chief of a band, a half caste, and civilized. b. -- Túch-ee (-----); chief of a band [called “Dutch,”] one of the most celebrated of the frontier Indians of the United States. 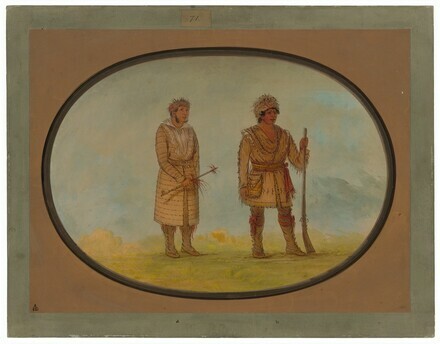 A tribe of 22,000, civilized and agricultural, transported by President Jackson from Georgia to the Upper Arkansaw. 1836. Extended loan for use by The White House, Washington, D.C., 1982-1984. Extended loan for use by Ambassador Joseph M. Rodgers, U.S. Embassy residence, Paris, France, 1985-1989. Loan for display with permanent collection, Etowah Mounds State Historica Site, Cartersville, Georgia, 1991-1992. American Paintings and Sculpture: An Illustrated Catalogue. National Gallery of Art, Washington, 1970: 26. American Paintings: An Illustrated Catalogue. National Gallery of Art, Washington, 1980: 118, repro. American Paintings: An Illustrated Catalogue. National Gallery of Art, Washington, 1992: 100, repro.